Permaculture is not only a sustainable farming method, it is a holistic approach to land-use, that combines the natural landscaping and edible gardening. It offers practical benefits as well as aesthetics ones. OIC believes that by sharing permaculture knowledge with local people, they will understand how to work alongside the rainforest, as well as develop a means to an income. This means they are much more likely to help the forest stay intact and thereby provide viable habitat for orangutans. 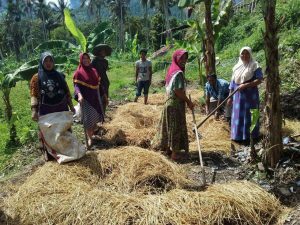 This home garden training was provided to residents from Kota Panjang and Blang Jerango subdistrict, Gayo Lues district of Aceh Province. A further one-day training session was attended by 36 local residents of 5 different villages in Kota Panjang and Jerango subdistricts; Rema village, Cike village, Beranang village, Penosan Induk village and Penosan Sepakat village. The participants of this training were housewives – the aim being to encourage them to use their yard area as their home garden. Not only can this approach lead to a delicious and more varied diet, but it also offers potential in creating a market for garden produce which can help women develop their own income. On this training, these women were taught permaculture principles, home garden design, integrated pest management, composting and field practice in one of the participants’ garden. After the training, the participants were provided with a liquid compost drum, a watering can, and a hoe. The next stage of this training is to support them as they develop their home gardens. 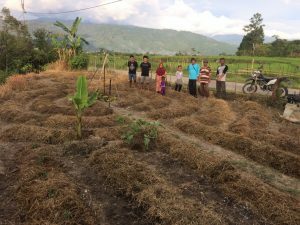 By practicing this home garden training, these local residents can produce their own quality food and earn extra income by selling their extra crops. This means that people are much less likely to use unsustainable farming methods which can threaten the forest.